North and South Korea may be on the verge of announcing a peaceful end to the Korean War, which has gone on since 1950. A South Korean intelligence source reportedly said the upcoming meeting between North Korean leader Kim Jong Un and South Korean President Moon Jae-in could result in the announcement. North Korea seemed destined for war with South Korea and the US just one year ago, but many significant shifts have taken place, though experts remain skeptical. The upcoming summit between North Korean leader Kim Jong Un and South Korean President Moon Jae In could result in a historic announcement, with the sides declaring an end to the 68-year long war on the peninsula, according to a report. Newspaper Munhwa Ilbo cited an unnamed South Korean intelligence source as saying the coming Kim-Moon summit on April 27, the first time the leaders will meet face-to-face, may result in a peace announcement. The news follows weeks of planning between the South and North that kicked off with a thawing of previously tense relations during the Winter Olympics. Since then, Kim has expressed an unprecedented willingness to talk to the South, a desire to talk about denuclearization with the US, and traveled outside his country for the first time since assuming power in 2011 to meet Chinese President Xi Jinping. North Korean leader Kim Jong Un watches a performance given with splendor at the People's Theatre on Wednesday to mark the 70th anniversary of the founding of the State Merited Chorus in this photo released by North Korea's Korean Central News Agency (KCNA) in Pyongyang on February 23, 2017. KCNA/via REUTERS ATTENTION EDITORS - THIS PICTURE WAS PROVIDED BY A THIRD PARTY. REUTERS IS UNABLE TO INDEPENDENTLY VERIFY THE AUTHENTICITY, CONTENT, LOCATION OR DATE OF THIS IMAGE. FOR EDITORIAL USE ONLY. NOT FOR SALE FOR MARKETING OR ADVERTISING CAMPAIGNS. NO THIRD PARTY SALES. NOT FOR USE BY REUTERS THIRD PARTY DISTRIBUTORS. SOUTH KOREA OUT. NO COMMERCIAL OR EDITORIAL SALES IN SOUTH KOREA. North Korean leader Kim Jong Un visits the Samchon Catfish Farm, in this undated photo released by North Korea's Korean Central News Agency (KCNA) in Pyongyang on February 21, 2017. KCNA/Handout via Reuters ATTENTION EDITORS - THIS PICTURE WAS PROVIDED BY A THIRD PARTY. REUTERS IS UNABLE TO INDEPENDENTLY VERIFY THE AUTHENTICITY, CONTENT, LOCATION OR DATE OF THIS IMAGE. FOR EDITORIAL USE ONLY. NO THIRD PARTY SALES. SOUTH KOREA OUT. THIS PICTURE IS DISTRIBUTED EXACTLY AS RECEIVED BY REUTERS, AS A SERVICE TO CLIENTS. North Korean leader Kim Jong Un visits the Kumsusan Palace of the Sun on the birth anniversary of late leader Kim Jong Il (the Day of the Shining Star), to pay tribute to him, in this undated photo released by North Korea's Korean Central News Agency (KCNA) in Pyongyang on February 16, 2017. KCNA/Handout via Reuters ATTENTION EDITORS - THIS PICTURE WAS PROVIDED BY A THIRD PARTY. REUTERS IS UNABLE TO INDEPENDENTLY VERIFY THE AUTHENTICITY, CONTENT, LOCATION OR DATE OF THIS IMAGE. FOR EDITORIAL USE ONLY. NO THIRD PARTY SALES. SOUTH KOREA OUT. THIS PICTURE IS DISTRIBUTED EXACTLY AS RECEIVED BY REUTERS, AS A SERVICE TO CLIENTS. North Korean leader Kim Jong Un meets Song Tao, the head of the China's Communist Partyï¿½ International Department who led a Chinese art troupe to North Korea for the April Spring Friendship Art Festival, in this handout photo released by North Korea's Korean Central News Agency (KCNA) on April 15, 2018. KCNA/via REUTERS ATTENTION EDITORS - THIS PICTURE WAS PROVIDED BY A THIRD PARTY. REUTERS IS UNABLE TO INDEPENDENTLY VERIFY THE AUTHENTICITY, CONTENT, LOCATION OR DATE OF THIS IMAGE. NO THIRD PARTY SALES. SOUTH KOREA OUT. 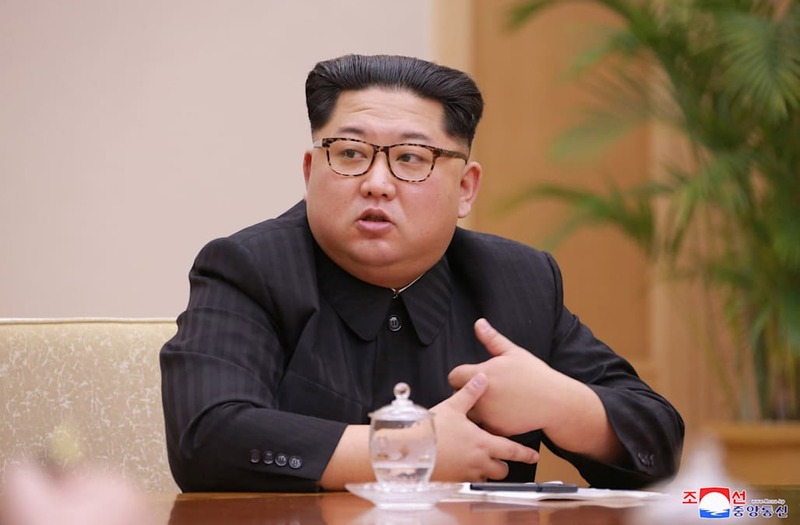 North Korean leader Kim Jong Un speaks in Beijing as he paid an unofficial visit to China, in this undated photo released by North Korea's Korean Central News Agency (KCNA) in Pyongyang March 28, 2018. KCNA/via Reuters ATTENTION EDITORS - THIS IMAGE WAS PROVIDED BY A THIRD PARTY. REUTERS IS UNABLE TO INDEPENDENTLY VERIFY THIS IMAGE. NO THIRD PARTY SALES. NOT FOR USE BY REUTERS THIRD PARTY DISTRIBUTORS. SOUTH KOREA OUT. NO COMMERCIAL OR EDITORIAL SALES IN SOUTH KOREA. North Korean leader Kim Jong Un and his wife Ri Sol Ju are seen in Beijing, as he paid an unofficial visit to China, in this undated photo released by North Korea's Korean Central News Agency (KCNA) in Pyongyang March 28, 2018. KCNA/via Reuters ATTENTION EDITORS - THIS IMAGE WAS PROVIDED BY A THIRD PARTY. REUTERS IS UNABLE TO INDEPENDENTLY VERIFY THIS IMAGE. NO THIRD PARTY SALES. NOT FOR USE BY REUTERS THIRD PARTY DISTRIBUTORS. SOUTH KOREA OUT. NO COMMERCIAL OR EDITORIAL SALES IN SOUTH KOREA. North Korean leader Kim Jong Un and his wife Ri Sol Ju are seen near a train as he paid an unofficial visit to China, in this undated photo released by North Korea's Korean Central News Agency (KCNA) in Pyongyang March 28, 2018. KCNA/via Reuters ATTENTION EDITORS - THIS IMAGE WAS PROVIDED BY A THIRD PARTY. REUTERS IS UNABLE TO INDEPENDENTLY VERIFY THIS IMAGE. NO THIRD PARTY SALES. NOT FOR USE BY REUTERS THIRD PARTY DISTRIBUTORS. SOUTH KOREA OUT. NO COMMERCIAL OR EDITORIAL SALES IN SOUTH KOREA. FILE PHOTO: North Korea's leader Kim Jong Un speaks during a New Year's Day speech in this photo released by North Korea's Korean Central News Agency (KCNA) in Pyongyang on January 1, 2018. KCNA/via REUTERS/File Photo ATTENTION EDITORS - THIS PICTURE WAS PROVIDED BY A THIRD PARTY. REUTERS IS UNABLE TO INDEPENDENTLY VERIFY THE AUTHENTICITY, CONTENT, LOCATION OR DATE OF THIS IMAGE. NO THIRD PARTY SALES. NOT FOR USE BY REUTERS THIRD PARTY DISTRIBUTORS. SOUTH KOREA OUT. North Korean leader Kim Jong Un visits the national science centre in this undated photo released by North Korea's Korean Central News Agency (KCNA) in Pyongyang January 12, 2018. KCNA/via REUTERS ?ATTENTION EDITORS - THIS PICTURE WAS PROVIDED BY A THIRD PARTY. REUTERS IS UNABLE TO INDEPENDENTLY VERIFY THE AUTHENTICITY, CONTENT, LOCATION OR DATE OF THIS IMAGE. NO THIRD PARTY SALES. SOUTH KOREA OUT. During the thaw, North Korea has seen an influx of South Korean visitors, including diplomatic delegations and Korean pop bands, with Kim himself sitting in on a performance that he reportedly loved. North Korea has also opened up the Kim family to publicity, sending his sister Kim Yo Jong to the games and upgrading the status of Ri Sol Ju, the wife of North Korean leader Kim Jong Un, from "comrade" to "revered first lady" in a potential bid to create a cult of personality around her. The US maintains a wait-and-see attitude toward the talks, and has vowed to stay tough on North Korea by not letting up on sanctions or military pressure. But the customary military exercises that take place with the US and South Korea have been delayed and toned down since last year. Experts remain skeptical that North Korea would actually go through with its promises to denuclearize, as it has entered into negotiations in the past only to have them fall apart when it came time to inspect their nuclear sites. But South Korean diplomats repeatedly say Pyongyang has stuck to its promise of denuclearization, and even laid out specific plans for implementation. In any case, the relations between North Korea and the world have markedly turned since last year when President Donald Trump threatened the country with presumably nuclear "fire and fury" and Pyongyang spoke of firing missiles at US forces in Guam and detonating nukes in the sky.